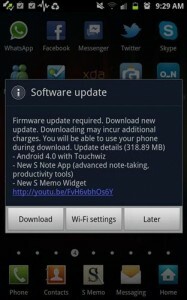 Ice Cream Sandwich Begins to Appear in the Galaxy Note: The latest version of the Android OS, Ice Cream Sandwich, begins to appear for download on the Samsung Galaxy Note, the hybrid terminal ‘smartphone‘ and ‘tablet’ of South Korea. Some users have already received the update message. This new version of the operating system provides a completely different Android. It has a redesigned user interface with new features such as multitasking, new notifications, access point Wi-Fi, NFC support and a more complete browsing experience. Among other innovations, the new version of Android include unlocking the terminal through facial recognition. The first handset to demonstrate this was the Galaxy Nexus. There are few users of Galaxy Note for the time being chosen as they have begun to receive a non-official to update the system, and so make the jump to version 4.0. Android and premium applications suite. It seems that those fortunate moments are in Germany and other European countries. Nothing was known about this possible update from the leaks that occurred in April. 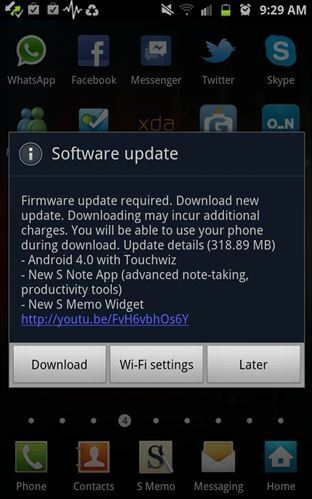 In March, when it began to update the Galaxy S II, the company has reported that Note would be his next target. Meanwhile, the new Galaxy S III will be released directly to the latest operating system from Google. Samsung has not yet made any official confirmation, but some users who have received the notice have risen very proudly a picture of your device to Twitter. The update includes the new application premium S Note, which is a different book with comprehensive creative tools.